Financial institutions around the globe are taking measures to combat skimming, one of the most prevalent crimes at the ATM. How could ATM fraud happen to you? ATM fraud and theft are some of the largest concerns in banking today. 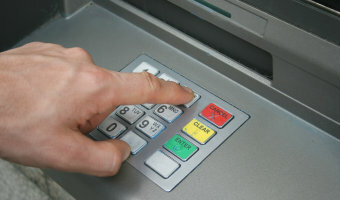 ATM skimming is the most common type of ATM fraud. Skimming involves a compact card reader called a skimmer which when attached to the ATM's actual card reader captures and replicates the card's data when it is inserted into the machine. This stolen card data is then used to create a fraudulent duplicate of the actual card. Cards must be inserted long-edge first, helping to prevent external skimmers from reading card data. A moving, encrypting read head preventing skimmers from reading the card's full magnetic stripe, helping prevent the ability to steal card data. It also helps prevent criminal modification to the card reader as current skimmers do not have this technology. Helps reduce risk of card data capturing and tracking by encrypting communication to the central processing unit (CPU). Each ActivEdgeTM card reader is paired with a specific ATM terminal to help prevent the installation of fraudulent devices. While technology can certainly provide increased security, it is extremely important to check your account activity on a regular basis to ensure you can account for all transactions. Any unfamiliar charges should be reported immediately to our Operations Division at 724.206.1170.